Keeping an infant still for the 15 or so seconds required for a photographic exposure during the Civil War period often required a helpful hand from mom. 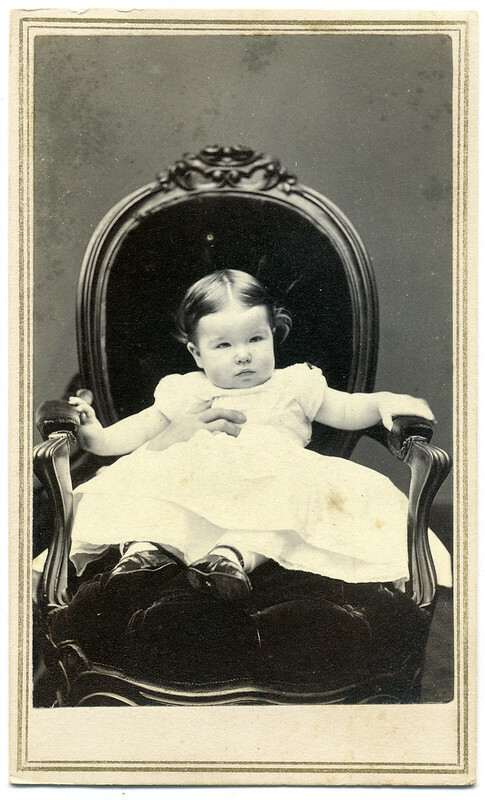 In this carte de visite, by Seaver of Boston, Mass., the hand of the child’s mother can be seen wrapped around the baby’s waist. 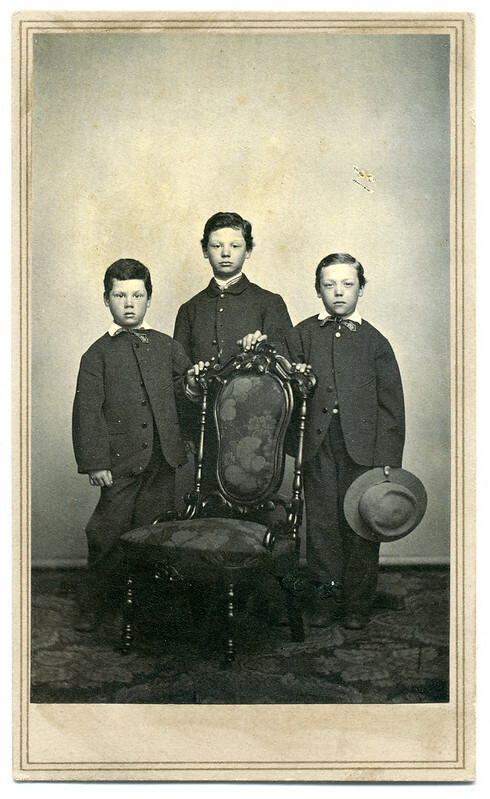 The suits worn by these three youngsters are in the same style and make as clothes worn by adults, a common practice of the times. In this case, the little boy pictured on the right holds a child’s version of a proper hat. 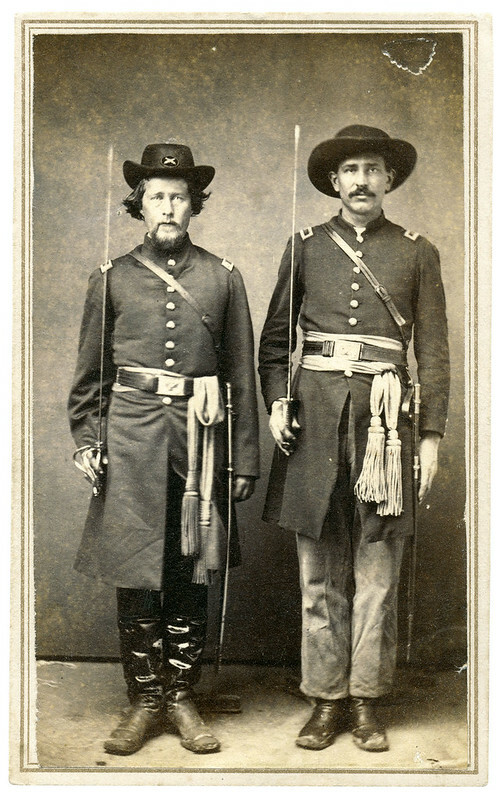 The photograph, from the studio of Hovey & Moulton of Rome, N.Y., dates from the Civil War period. 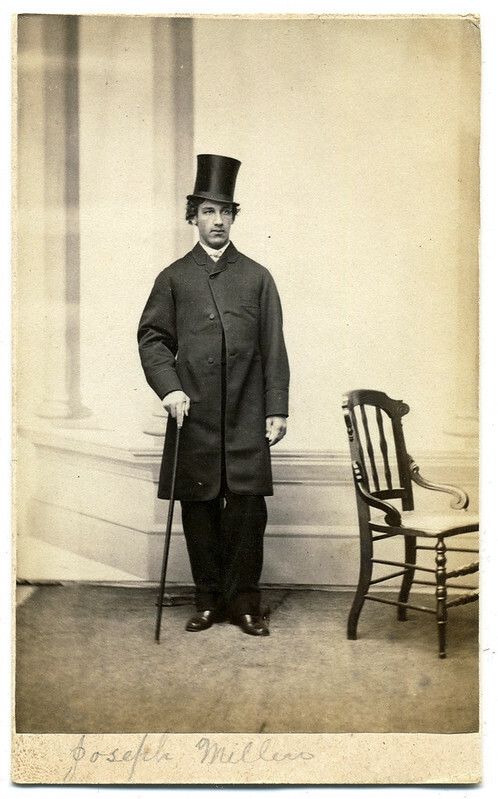 A gentleman identified in period pencil as Joseph Miller strikes a casual pose with frock coat, top hat and cane. He stood for his likeness in the studio of B.F. Smith & Co. of Portland, Maine. 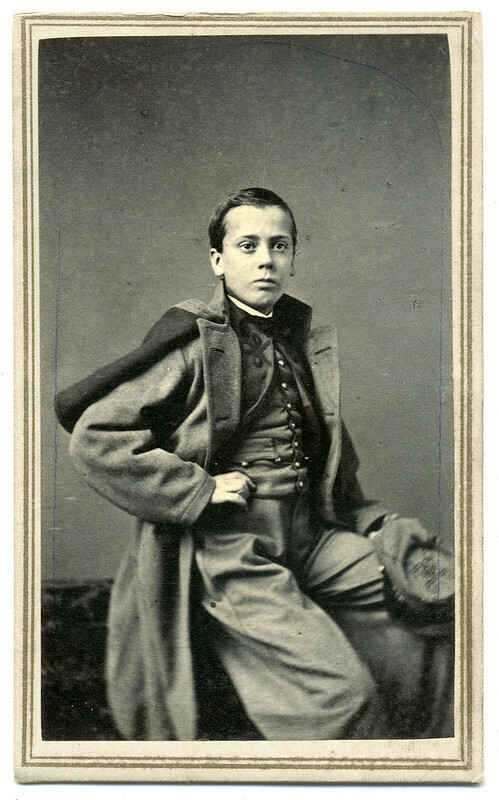 The style of the mount and the fashion worn by this man dates the portrait to the Civil War period. 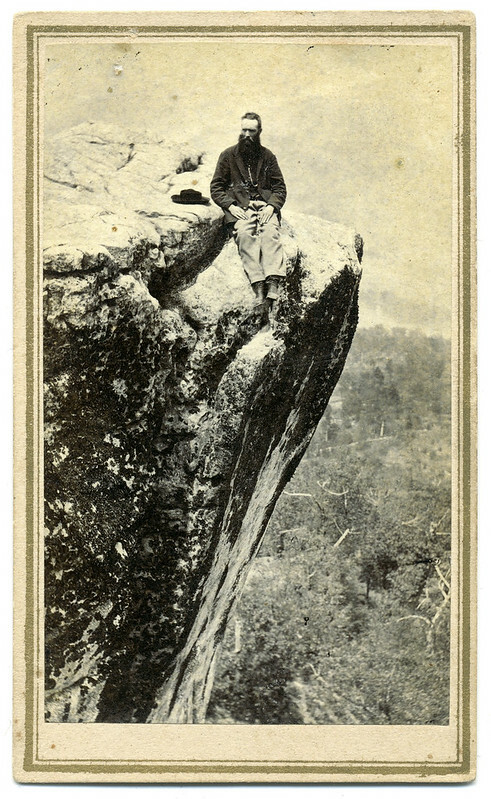 A federal private is seated on Lookout Mountain, his hat laying beside him. This spot was a favorite for soldiers, families and others touring the Chattanooga battlefield during the Civil War, and continues today. In the 1860’s photographers were looking for a way to boost their business. Because of this, they thought of a way to make the subjects appear twice in the photograph – thus the birth of double exposure. In the images presented here, you can see that the subject is seen twice in the photo but having a different position. To create this type of image, the photographer would shoot the subject in one position and then the subject must move swiftly to another position before the second image is taken. The photographers also used rotating lens caps and special plates to come up with these double-exposed images. 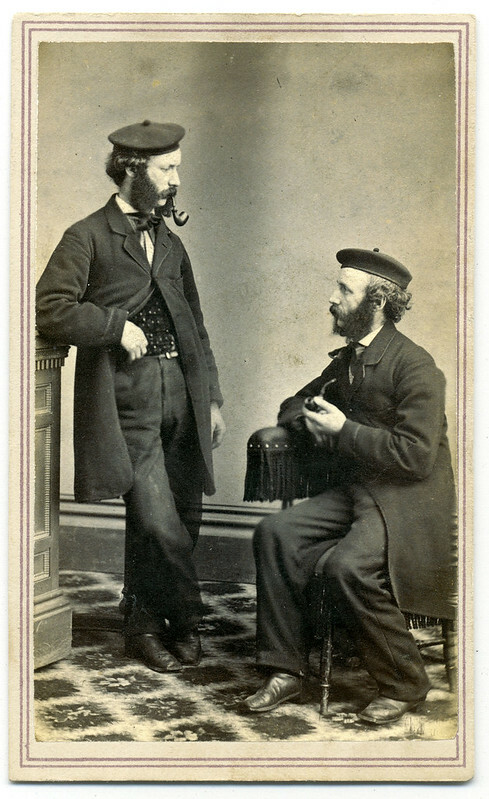 A pencil inscription on the back of this carte de visite identifies the group as “Dr. 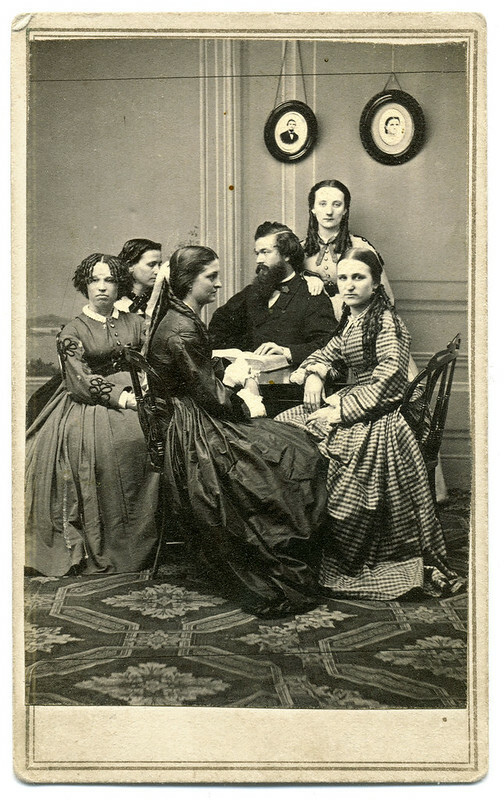 Miller, wife & sisters.” The writing is post-Civil War, which suggests it was added at some point after the image was removed from an album. The album sleeve or index page at the front of the album likely contained the information. The lack of photographer’s back mark or any other information presents enormous challenges in tracing the origin of this particular physician. Dr. Miller’s wife is likely the woman standing behind him with her hand on his shoulder. His sisters sit in various states of repose around him. Each face is a study within itself. 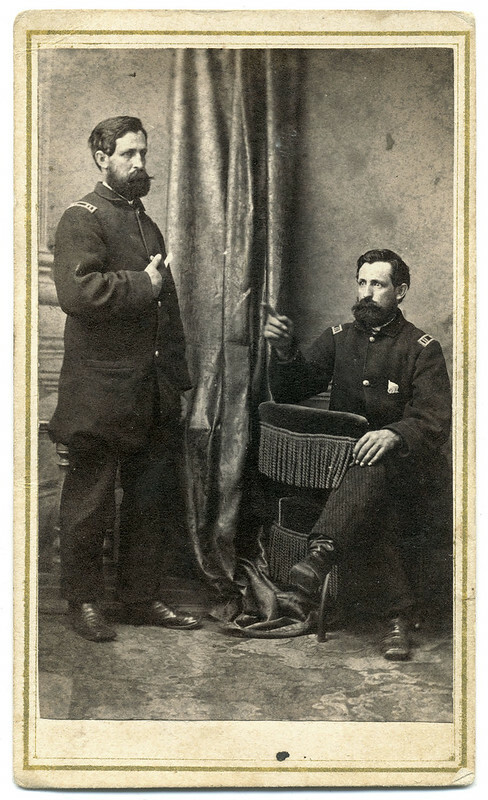 This carte de visite by B.H. 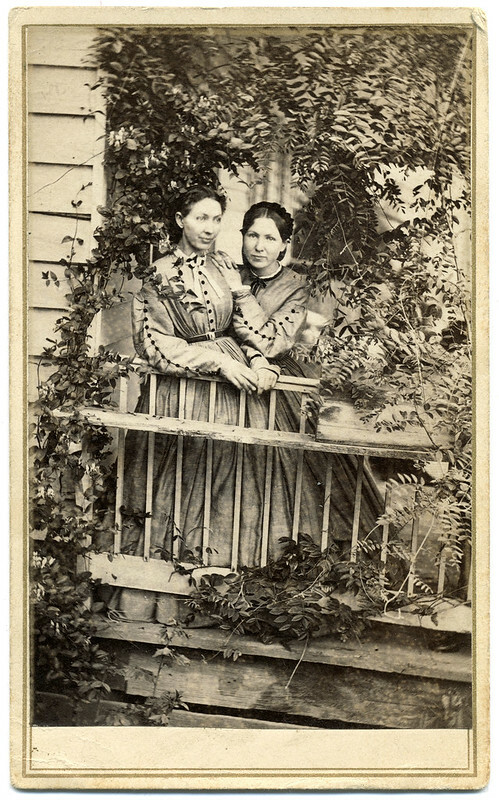 Rounds of Cannelton, Ind., pictures two women framed by a wreath of ivy as they stand on a porch. One woman, perhaps the younger, lay her clasped hands on the shoulder of the older, and she rests an arm and hands on the well-worn rail. Cannelton, Ind., was home to Cannelton Cotton Mill. Built in 1849, it was at one time the largest industrial building in the U.S. west of the Allegheny Mountains.